Who wants to go to Cuba?! Trips to this beautiful Caribbean island have become “en vogue” since travel restrictions were lifted a couple years ago. As some of you know, I’m a proud Cuban-American and have been traveling there since I was a little girl. I’ve been looking forward to writing this post since it’s like my second home. 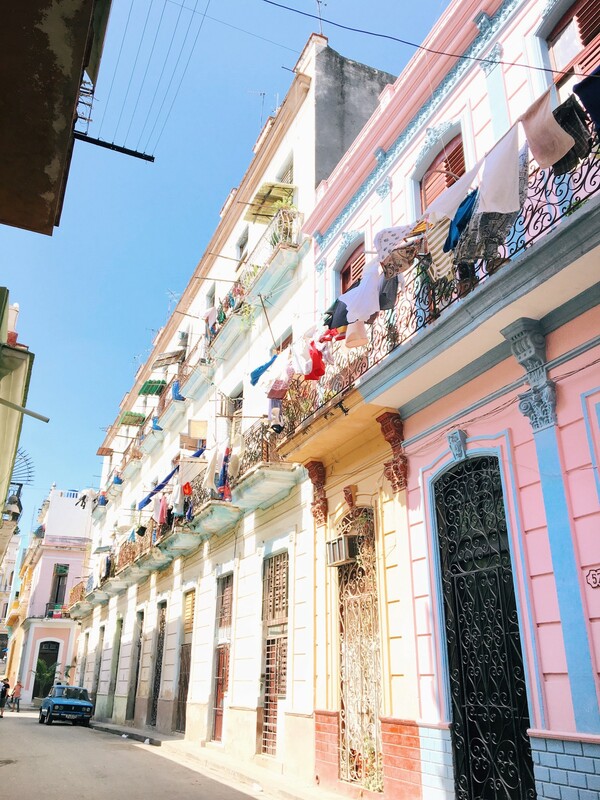 I visit often and usually stay at my Abuela’s (grandma’s) house to experience “real” Cuba. I’m super excited to share some AUTHENTIC travel tips, favorite dishes, and places to visit! 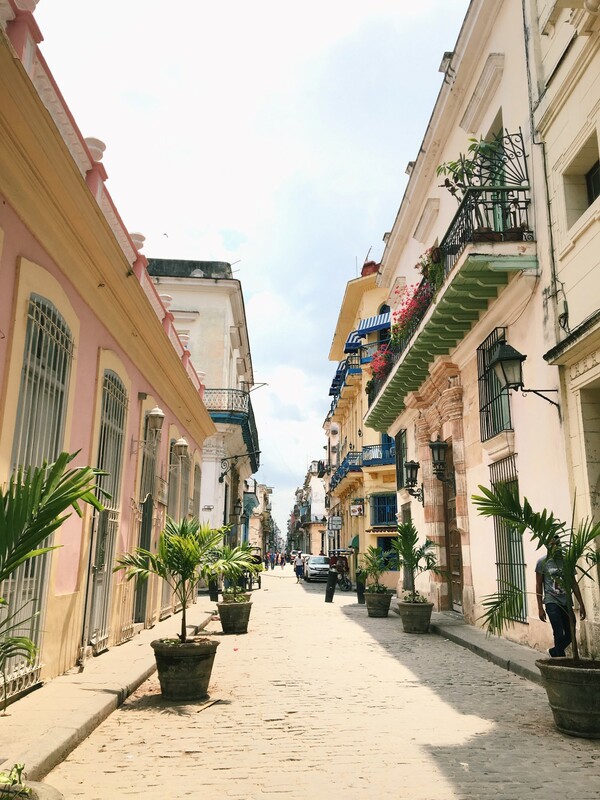 Cuba has so many amazing places and things to do! The city, beaches, and countryside are all incredibly beautiful in their own way. It really depends on your personal preference and length of stay. 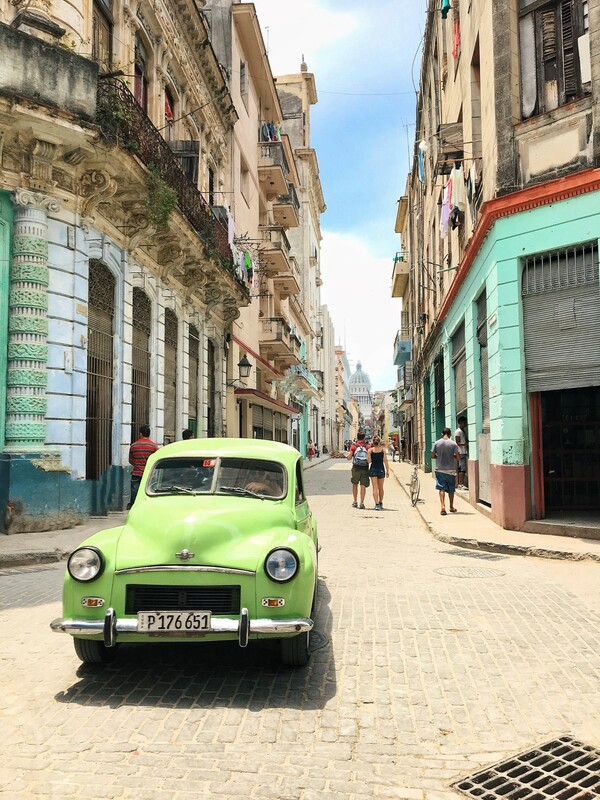 Havana is the most famous city in Cuba, known for classic cars and bright, historic architecture. You’ll feel like you’ve been transported back to a simpler time. 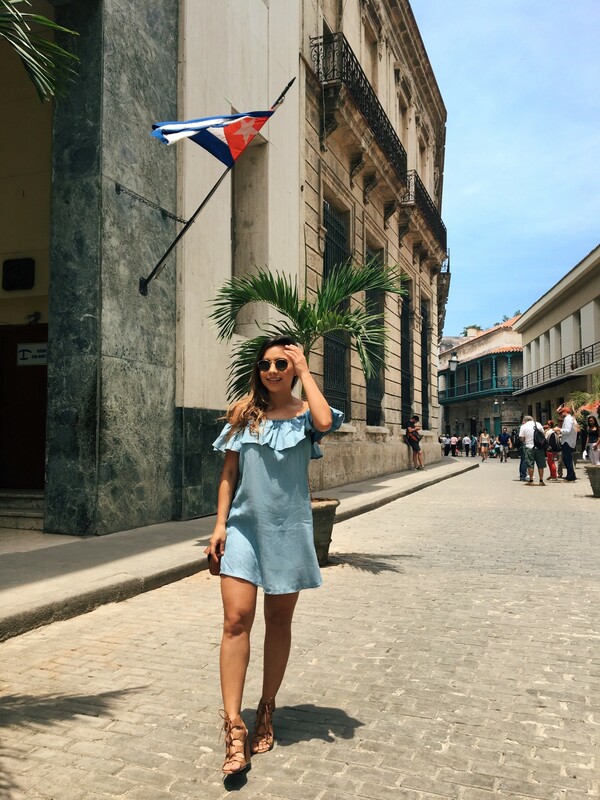 Must see spots include Plaza de la Catedral, El Capitolio, El Morro, Malecon, Gran Teatro de La Habana, and Plaza de la Revolución. All the places I’ve listed above are worth a visit but I’ll provide a little more detail on my favorites. El Morro is a stunning fortress built to guard the entrance to Havana Bay. The ocean views from the top are absolutely stunning! 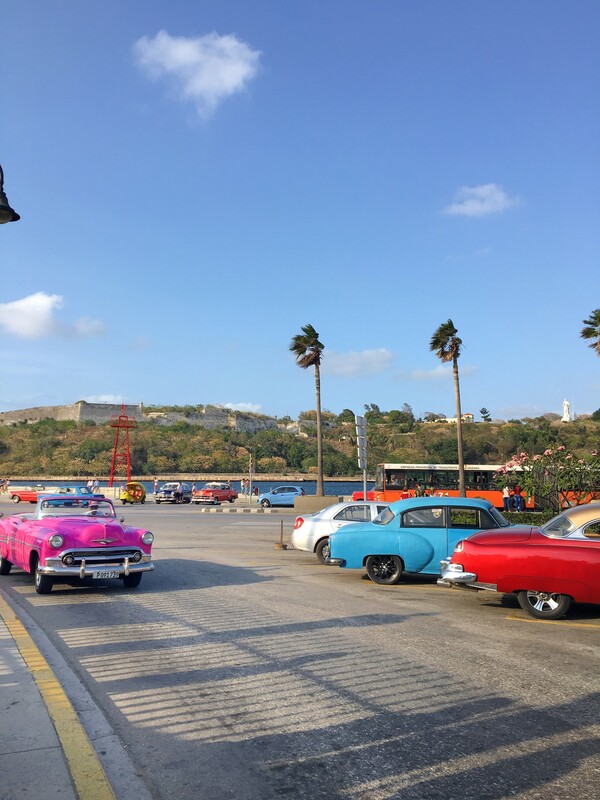 The Malecon literally captures the soul and essence of Cuba. It’s a vibrant 5-mile stretch of road separating the sea and city. A walk along the esplanade at sunset is nothing short of magical. The sun lights up the pastel painted buildings to literally make the city glow. The recently remodeled Gran Teatro de La Habana (grand theater) is a visually stunning theater and makes for some amazing IG pics. Last but not least, the Plaza de la Revolución. There might not be a more iconic picture to take on your trip than the famous plaza featuring a giant Cuban flag and face of famous guerilla leader, Che Guevera. 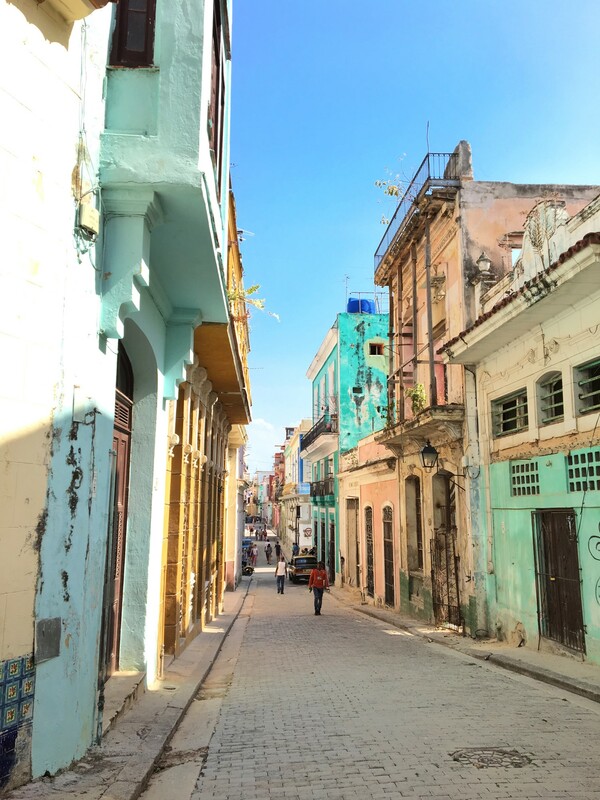 If you’re going to Cuba for fun in the sun, you won’t be disappointed. Fortunately, many of the country’s best beaches are located right in and around Havana. Playas del Este is a 6 mile stretch of gorgeous coastline located about 20 minutes from the city. There are a number of different beaches there but the most popular is Santa Maria del Mar. During the busy season it can be difficult to find a spot but if you want to be where the action is, this is your beach! If you want a more relaxing and secluded beach, try Boca Ciega. It’s just a little bit further along Playa del Este but much quieter, less touristy, and the surrounding bars and restaurants are less expensive. Most visitors never even consider venturing outside of Havana and the surrounding beaches. If you’re the adventurous type and looking for a truly unique experience, sign up for a tour of the Cuban countryside. I recommend a private or group tour from Havana to Viñales. 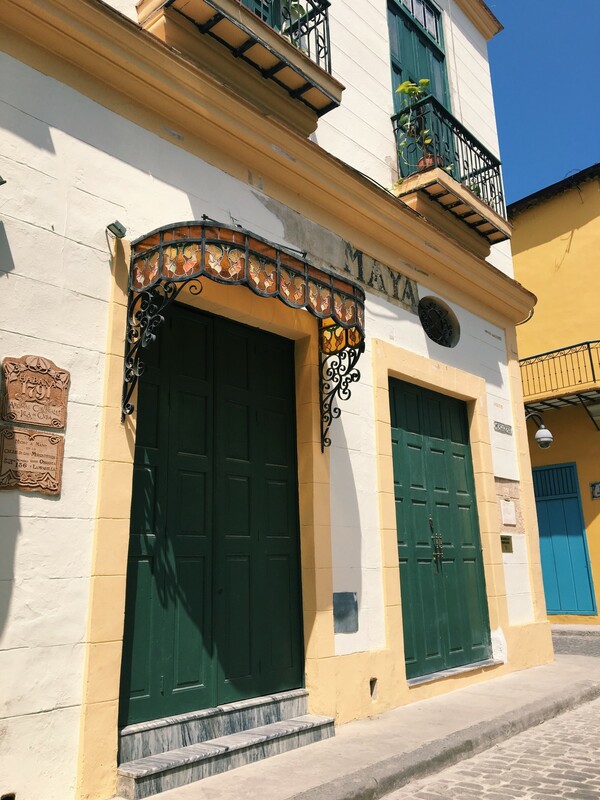 Imagine horseback riding through lush tobacco fields where they make world famous Cuban cigars or exploring the 300,000-year-old La Cueva Del Indio (Cave of the Indians.) These are the incredibly unique things you can do in Viñales. Other exciting spots include the Jardin Botanico de Viñales (botanical gardens) and the beautiful mural called Mural de la Prehistoria. You can schedule this as a day trip but heads up its about 2.5 hours each way so plan accordingly. I recommend staying at least 2 days so you’re not rushed and can experience all Viñales has to offer. There are many hotels in Havana to choose from. 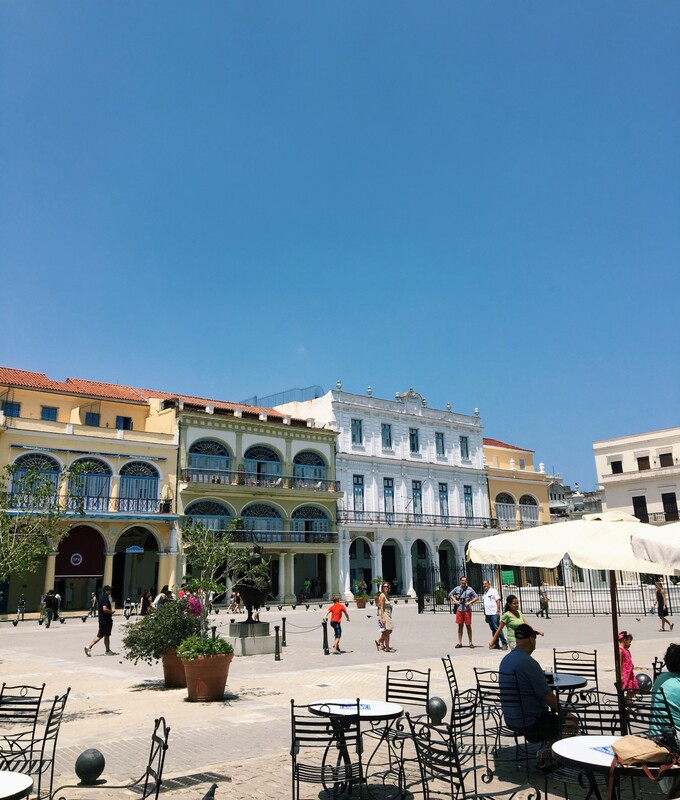 Last year, Jason and I stayed at Hotel Nacional and we absolutely loved it. 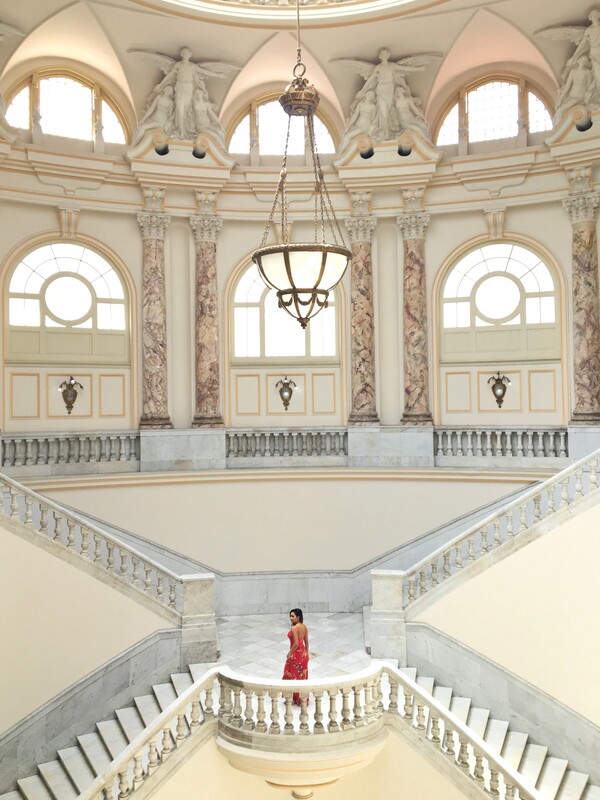 It’s one of the most historic and beautiful hotels in all of Cuba. The hotel has an amazing complimentary breakfast, 3 restaurants, outdoors lounge bars, Wi-Fi, and even a fitness room. If you’re looking to save money I recommend staying in “casas particularles” or private homes, which can be rented through Air BnB. They’re significantly less expensive than hotels but keep in mind these will come without many of the amenities we’re accustomed to. You should expect to pay around $50 per night for a casa particular. You can travel to Cuba by cruise or flight. Many major airlines including American Airlines, Jetblue, and Delta have direct flights to Havana. Besides your air fare, there are 2 additional fees you will need to pay…a visa fee to enter the country and an exit fee. Some Airlines sell visas and even include the exit fee in the ticket price but not all so make sure to ask to avoid any surprises. Take sufficient cash to last you the entire length of your trip. You won’t find an ATM and most places don’t take credit cards. Pack sunscreen, comfortable shoes, toiletries, bug spray, a camera, hat, and sunglasses. Don’t take expensive personal items like shiny jewelry or designer bags. Keep it simple! You’re going to Cuba, not Paris ;). This is, of course, optional but every time I visit I take a bag with pencils, crayons, erasers, kids toothbrushes, wrapped candy, hair scrunchies, feminine hygiene products, anything small and easy to pack to give away as gifts. These items may seem insignificant to us but not to the Cuban locals. They will be much appreciated! Stay up on policy changes with Cuba under the Trump Administration. It remains to be seen how strictly new policy changes will be enforced so do your homework before planning a trip. Internet in Cuba is very, very limited. Some hotels will offer Wi-Fi but be prepared to be disconnected while you’re out exploring. You can buy a Wifi card, but internet speed will be slow. Do NOT drink tap water as you can get very sick. Drink bottled water and make sure the seal is intact before purchasing. While traveling in any foreign country, take extra steps to safeguard your passport such as a hotel safe. Cuba charges a 10% fee to convert U.S. cash to Cuban convertible pesos (CUC). You can exchange money at any offices known as CADECAs. Cuba is generally very safe but be aware and vigilant. Don’t leave belongings unattended or flash money, zip up your bags, and be aware of extremely friendly English speaking locals. You can purchase souvenirs and gifts such as Cuban cigars at the airport but it’s very important to do so after you pass the security check point. If you run out of cash, someone can wire money into any one of the Western Unions in Cuba from the US. 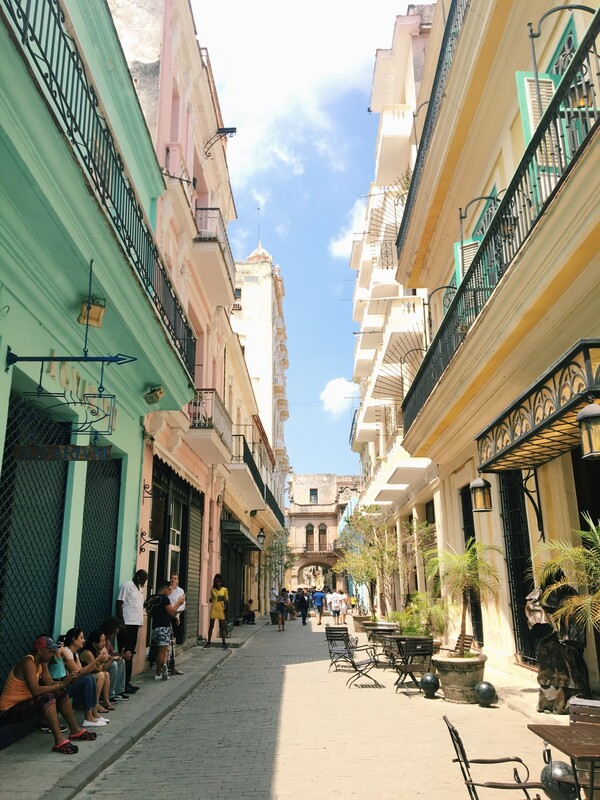 Now it’s time to mark Cuba off your bucket list! Start practicing your Spanish and I wish you an amazing travel experience! If you have any questions comment below, I would be happy to answer! Hey Lisa! First, thank you so much for this post! 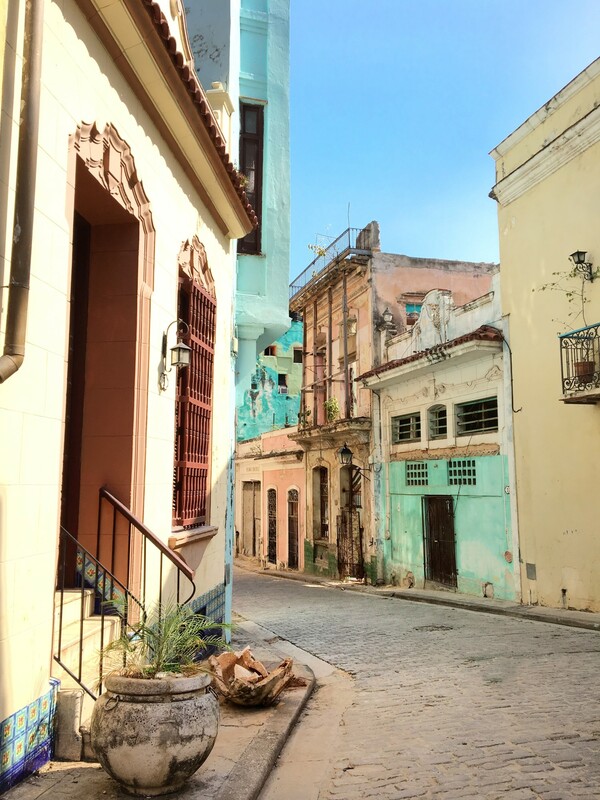 I have been wanting to go to cuba for a long time but I had so many questions ! under Trump’s new policies I don think so. You could before! You would probably have to go with the group guided tour. How much money on average would you suggest to take for 10 days in Cuba or average spending a day not including accommodation as we have that sorted already. with Trump’s new policies, person to person self travel is no longer allowed, meaning that Americans can only travel to Cuba in group tours and always with a guide. Also, they usually have a strict itinerary already created with government relegated locations. Thank you for the information. A couple of questions: do Americans need to get some sort of approval and/or have a specific reason to travel to there? I was told that you need a valid reason like work related or volunteer work, Also, do you need to get a special visa? You will need a visa to enter the country. Most airlines can you help you get one. It is really easy to get one. Thank you for the helpful information! Is it true that you have to submit paperwork/get approval to travel to Cuba as an American citizen? I was told that we can’t travel there unless we have a valid reason like work or volunteering. Looking forward to travel to Cuba at some point in the future. Love the bright row of houses and old-fashioned cars. Were you born in Cuba? Hi Lisa, my best friend and I are planning on traveling to Cuba. Is it easy to make calls through what’s app under WiFi? Or other ways to get phone service if staying in a hotel? Thank you! Great post! I Am Cuban too and I am going to visit soon since I have never been to Habana. Pregunta: donde fue tomada la segunda foto de este blog? Is a gorgeous photo. Hola Yasmin. fue en Gran Teatro de La Habana 🙂 buen viaje !! 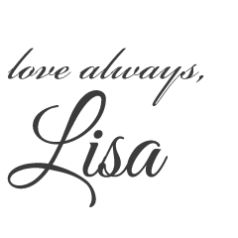 Hi Lisa I’m planning to travel La habana soon 🙂 I was wondered in wich website did I buy the hat that appears in your photos ❤️. GRACIAS ? Love and respect to the Cuba people. Thanks for sharing necessary information about traveling that city. This post is really good.